Every 30 seconds, a Latino citizen turns 18 and becomes a potential voter. This might not seem surprising—Latinos are the country's fastest growing demographic—but it makes them a rising electorate demographic with increasing political power. In 2016's increasingly heated election, Latinos have a lot of political clout. This does not bode well for Donald "Let's Build A Wall" Trump. 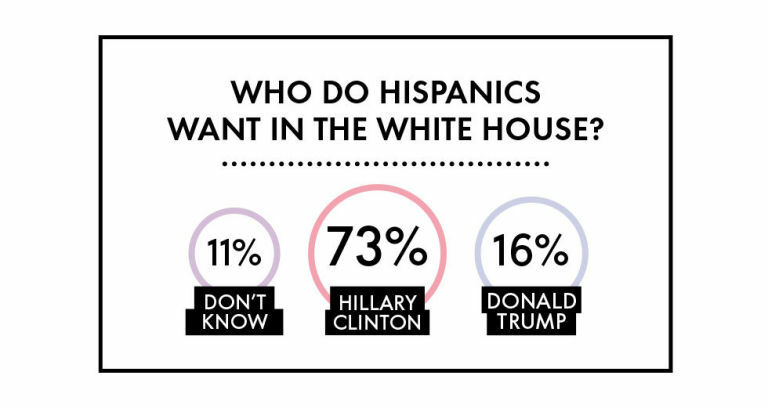 A White House matchup of Hillary v. Trump had Hispanic voters Standing With Her at 73% to 16%. 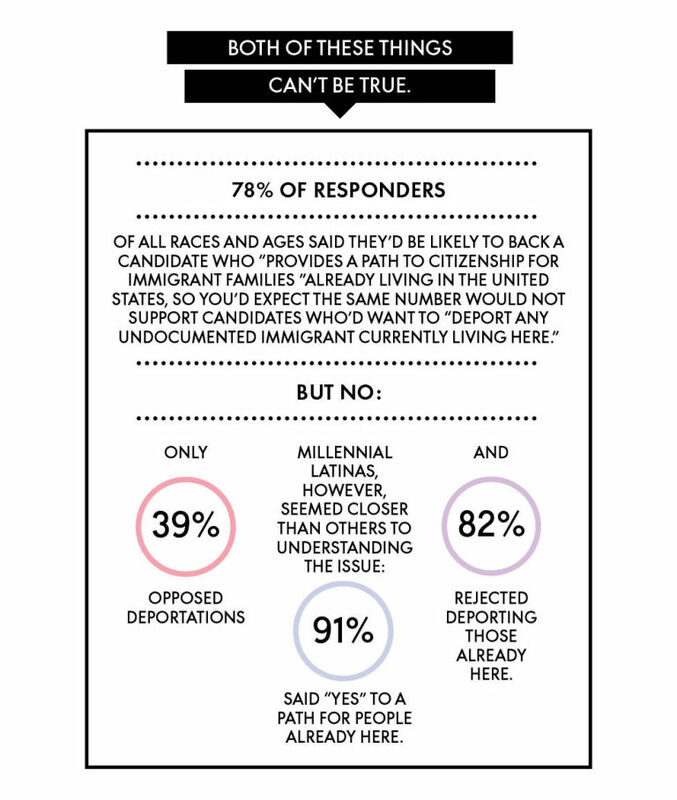 This tendency for Latinos to reject Trump perhaps matters most in Florida. Florida's electoral history—the state has supported both Bush and Obama twice—makes it one of 2016's seven swing states. Florida is also home to a substantial Latino population. Latinos make up about 15% of Florida's active registered voters, a hefty demographic that first turned blue in 2008 and continues to swing left. Since 2014, twice as many Hispanics have registered as Democrats than as Republicans—according to the Pew Research Center and Florida Department of State Division of Elections, the ratio is currently 38% Democrat and 27% Republican. In fact, a poll of the state's registered Hispanic voters found that 68% said Trump's immigration views made them less likely to vote for Republicans in the upcoming election, suggesting Trump's candidacy could push even more Latino voters into the Democrat's corner. 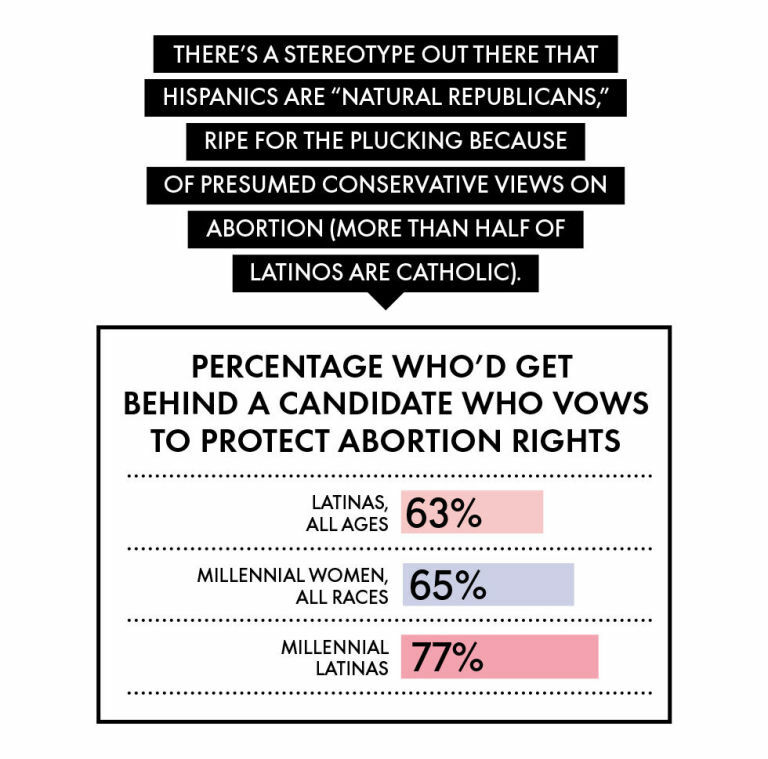 Young Latinas make up the core of this increasingly Dem demographic, possessing the most liberal views of any demographic we surveyed. So, what experiences are driving these voting preferences? What do they stand for? 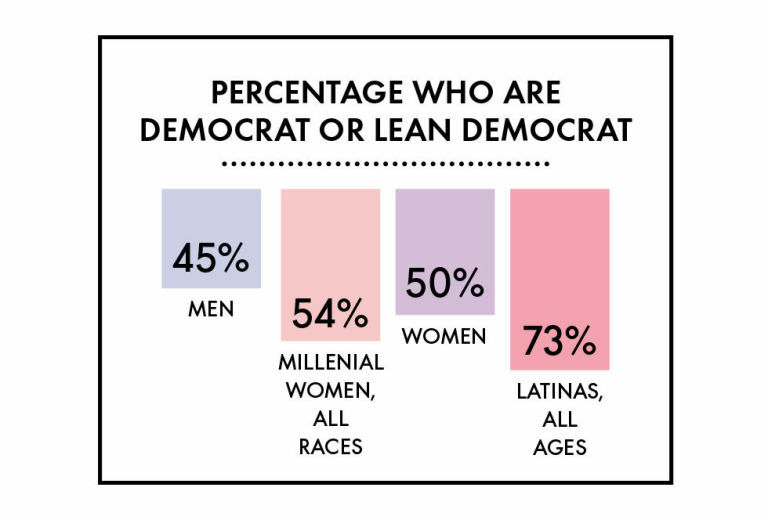 Latina millennials made up the largest segment of low-earners in ELLE's July issue survey—45% made less than $15 an hour—but they were also the most optimistic. A whopping 76% expected to be doing much or somewhat financially better in the next 5 years. They're hopeful for good reason. Younger Latinas are achieving more than ever before, with 41% completing some college or post-high school education and 25% graduating from college. That's a 9% and 6% increase from older Latina demographics. Millennial Latinas are also strong supporters of eliminating the wage gap, which disproportionately affects women of color. President Obama's Equal Pay Task Force notes that Hispanic women make approximately 60 cents to every dollar earned by a non-Hispanic white male. This is primarily because of factors—lower education levels, domestic expectations—that force Hispanic women into lower paying jobs. Women are also disproportionately affected by the United States' lack of universal paid sick leave. Since women are more likely to take care of family members and are more likely to be in lower-income jobs that don't provide sick leave, candidates that advocate for universal paid sick leave are working to help women. 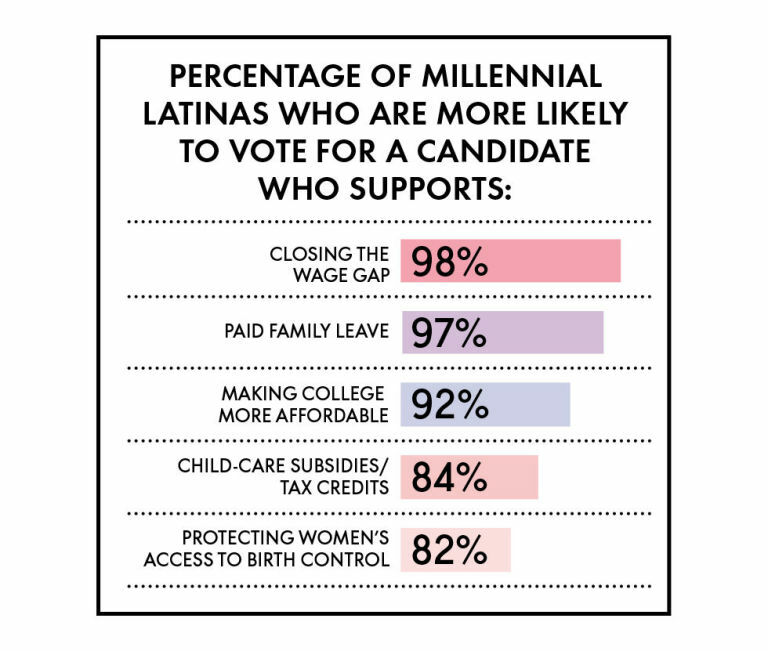 As the lowest earners we surveyed, Latinas recognize these systematic obstacles—99% support paid leave and 92% support making college affordable. That's 22% and 18% higher than all female millennials. By acting as the most supportive demographic for paid leave and affordable colleges, millennial Latinas are supporting taking action against the wage gap. All this boils down to one thing: young Latina voters have the real world experiences and strong ideological beliefs to influence a lot of states this November. American women survey conducted by Greenberg Quinlan Rosner Research; 800 registered voters, 400 Hispanic women; April 2016.